Retired Sheriff Roger Dale Shivers of Clay County, Georgia, 65, passed away Saturday, April 13, 2019 surrounded by his loving family. A native of Fort Gaines, GA., Roger was born July 18, 1953 and was the son of the late Inman Shivers and Justine Shivers Callaway. He was a graduate of Clay County High school and Andrew College, and was a member of Mt. Gilead Baptist Church. In 1977, he began his service in law enforcement as a sheriff’s deputy for Clay County. 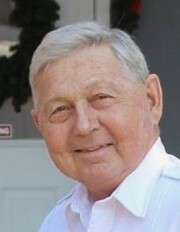 Once elected Sheriff of Clay County in 1981, he was the youngest Sheriff in the state of Georgia at that time. Roger honorably served Clay County for 36 years before retiring in 2017. During his years of service, Roger was wounded in the line of duty in 2001. Although he suffered a life threatening injury, Roger returned to duty and continued to faithfully serve his hometown for years afterward. Roger’s family says he will be remembered fondly for his lighthearted personality and teasing spirit. He wore his smile as easy as he wore his Sheriff’s uniform or grease stained clothes from working on heavy equipment. He spent his years of retirement working his small farm and spending time with his wife and grandchildren. Roger was preceded in death by his parents and his brother, James Olin Shivers. Roger will be lovingly remembered by his wife of 43 years, Suzanne Baxter Shivers, his children, Sheriff Locke (Kristie) Shivers of Fort Gaines, Rebecca (Eric) Truesdale of Colorado Springs, CO, his siblings Kathy (John Ray) Bailey of Colquitt, Justin (Charlotte) Shivers of Fort Gaines, and his grandchildren, Austin, Autumn, Kinley, Gabe, and Abigail. The family will receive friends on Tuesday, April 16 from 6:00 until 8:00 PM EST at Lunsford Funeral Home in Cuthbert, GA. Graveside funeral services will be conducted at 11:00 AM EST Wednesday, April 17, 2019 in the Shivers Family Cemetery on Cottonhill Road in Fort Gaines with Rev. Mike Hartley officiating. The family asks that memorials may be made to the Georgia Sheriff Youth Homes Attention Development Division, P.O. Box 1000, Stockbridge, GA 30281.